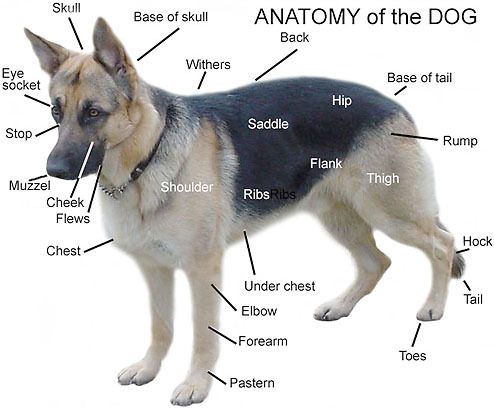 German Shepherd Anatomy Defined. When you start talking "dog" with breeders, veterinarians, dog owners, groomers and many others "in the know" you may hear all sorts of terms tossed about. You may or may not know exactly what each of the terms means. Don't be embarrassed - ask if you don't know, but if you're too shy to do so please read on. Below we will do our best to describe in everyday terms exactly what each of these German Shepherd Anatomy terms really means. Below find a photo of a beautiful German Shepherd Dog in England named Ralph. He will be our model for this short German Shepherd Anatomy lesson. Please feel free to refer to the photo to get a better idea of where what is. Most German Shepherd Anatomy terms will be pointed out in the picture, some may not. If that is the case I will try and physically describe as best I can where and what the term means and where it is on the body. HEAD AND SKULL - The head of the GSD is wedge shaped. It is also proportionate in size to its body. STOP - The indented area in the dog's forehead just above eye level - it tapers in a gentle slope evenly from the ears to the nose. MUZZLE - The GSD's wedge-shaped foreface. EYES - They should be medium sized, almond shaped and dark in color. EARS - The German Shepherd has erect medium sized ears. They should be carried upright and almost parallel in carriage. Tipped ears and droop ears are considered faults. MOUTH - The dentition of the GSD (42 teeth) must be strong, healthy and complete. The GSD maintains a scissor type bite. NECK - The neck of the German Shepherd should be strong, well muscled without dewlap. FLEWS - The pendulous hanging parts of the upper lips. SHOULDER - This is the joint at the uppermost part of the German Shepherds forelegs. WITHERS - This is the part of the GSD between the shoulder bones at the base of the neck. This is also the point from where the height of the dog is usually measured. BRISKET - This is the lower part of the chest - in front of and also between the German Shepherd Dog's forelegs. LOIN - This is the part of the body located on both sides of the backbone between the GSD's ribs and hip area. CROUP - This is the rear of the GSD's back just above the dogs hind limbs where the set-on of the tail occurs - should be a slightly sloping area. SADDLE - The darker area of many German Shepherds that looks as though the dog has a saddle painted on it's back. This is seen in many German Shepherds but not all - such as the solid black, white or sable GSD. RIBS - Should be moderately sprung - not barrel shaped. TAIL - This is the the hind-most part of the German Shepherds backbone, longer haired on the underside and carried in a slight curve. PASTERN - This area on a GSD's leg corresponds to the area between the wrist and hand on humans. STIFLE - The joint next above the hock, and near the flank, in the hind leg; rear hock joint bends backwards only. THIGH - This is the upper part of the GSD's hind leg. FOREARMS - The parts of the German Shepherd Dogs forelegs between the elbow and the pastern. FOREFOOT - These are the front feet of the German Shepherd. HINDFOOT - These are the back feet of the German Shepherd. HIPS - These are the joints at the uppermost part of the German Shepherds hindlegs. HOCK - These are the bones that form the ankle/heel of the German Shepherd. FEET - The front feet of the German Shepherd should be rounded, closed and arched while the hind feet should be closed, and slightly arched. The pads should be hard but not rough, and dark in color and the nails should be strong, arched and of dark also.